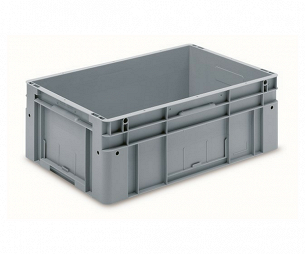 Automation container EUROTEC 600x400x220mm, designed for all major storage and conveyor systems. | George Utz Ltd. This EUROTEC automation container is primarily suitable for the automatic handling on all major storage and conveyor systems. There are also a number of interfaces on the container for robotic handling. Various versions of the base are available on request including heavy duty bases and an option for a double enclosed base. 4 shell handles are also available if required.